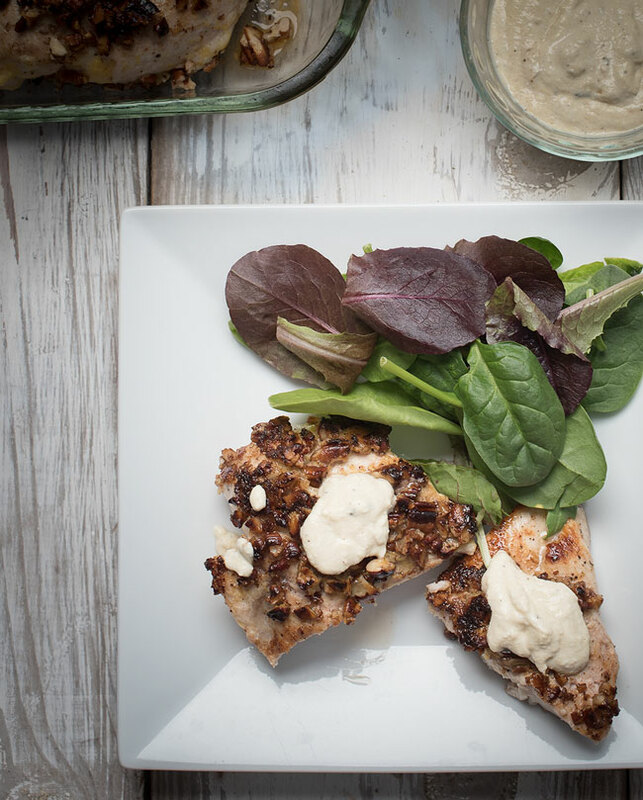 This Pecan Crusted Chicken with dijon sour cream is one of our all-time favorite chicken dishes. I think this might even edge out our crunchy chicken casserole, but it’s close and I love both. 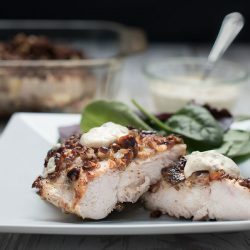 We love the flavors of the pecan crusted chicken recipe; the pecans end up with a toasted flavor and they pair so well with the dijon sour cream spread. I first had this chicken the summer after my dad remarried. It was the summer after fifth grade and it was the first summer we spent with my dad and stepmom. We were fortunate enough to spend time with my stepmother’s parents that first summer at their house in Tennessee. They have a yard out of a kid’s dream. A pond, a boat, lots of lawn, but also tons of trees. A big front porch, tons of books in the house. I’m sure we terrorized them, but it was amazing to us. Divorce and blended families can be a minefield, but there can be great things to come out of it. I was able to visit them with our kids a couple summers ago, the kids loved it and spent hours running around, exploring, and catching fireflies. Anyway, back to the pecan chicken. I’m not sure if we had this at my stepmother’s parents house, or just that she had the recipe from them and made it that summer. It was amazing. The original recipe included more butter, but I cut back just because it is more calorie friendly and can be eaten more often!! Win win. Greg grew up with pecan trees in his yard and always enjoyed pecans from a young age. When fall rolled around it meant there was always a quick snack there on the ground; Just grab two pecans and squeeze them together in your hands, using one to crack the other. It’s a trick that takes a few trials to master, but it sure came in handy since the average 10-year-old doesn’t carry around a nutcracker in their pocket. Now that we have kids of our own, we are hopeful that we can start our own family pecan tradition. We don’t have a pecan tree in our yard (yet), but when we visited my parent’s house last fall we were able to harvest a lot of pecans that we later used for baking. The kids really enjoyed the collection process and there is something special about harvesting fresh ingredients from your natural environment? Somehow the final product just always tastes better. Plus, who doesn’t love smashing things with a rubber mallet? While Greg did enjoy many fresh from the tree pecans as a kid, there’s no question that when you toast pecans their flavor soars to a whole new level. 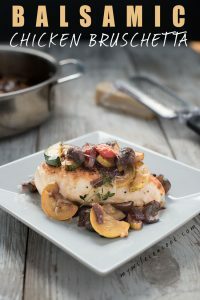 It’s one of our absolute favorite flavors which is maybe why we love this pecan crusted chicken and use toasted pecans in many of our recipes: Maple Pecan Granola, Pear and Pecan Salad, Easy Chocolate Pecan Pie. It’s definitely true that toasting pecans leads to a more intense flavor. If you’ve never toasted pecans before you definitely have to try it and you might want to check out this wiki article on how to toast pecans. We find that toasted pecans are consistently one of those ingredients that becomes the star of the show and elevates the main ingredient. 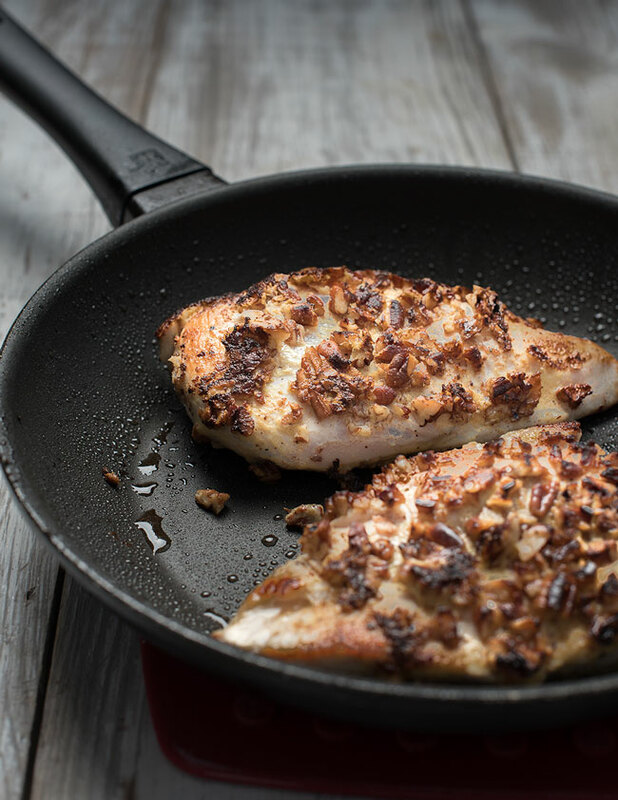 So it’s no wonder that this pecan-crusted chicken is one of our favorite chicken dishes. 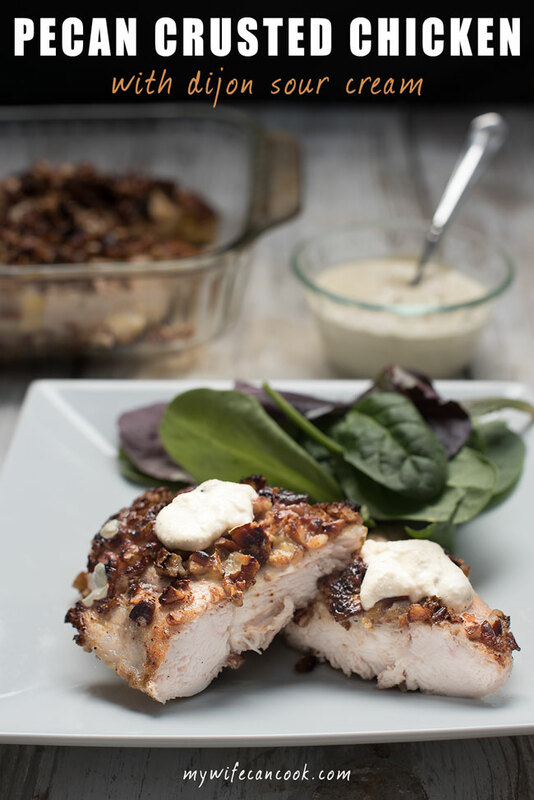 Chicken…well, it’s chicken…but when crusted with toasted pecans and the dijon sour cream sauce it becomes something entirely different. You have to try it to understand! So check out the recipe below! Flatten chicken breasts between wax paper with a meat pounder and season with salt and pepper. Melt 3 T. butter and whisk in 3 T. dijon mustard. Dip chicken into butter/dijon mustard and then into chopped pecans. Add 1 T. oil and 1 T. butter to nonstick pan and heat pan on medium. Saute chicken approximately 3 minutes per side and then place in greased 13x9 inch pan (this will need to be done in batches--wipe pan out inbetween batches so that pecans don't burn). Once all the chicken has been sauteed and placed in 13 x 9 inch pan, cook in oven for an additional 20 minutes. Deglaze pan with sour cream, remaining 2 T. of dijon mustard, and salt and pepper. 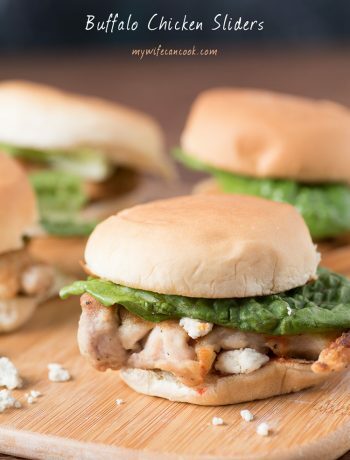 Serve chicken with sour cream dijon sauce. This looks absolutely incredible! 🙂 YUMMM!! Thanks Emilie! We love it! I love the idea of this. Since you don’t brine the chicken, does it start to dry out? I don’t eat much white meat chicken because I can’t stand how dry it tastes (even when cooked appropriately and checked with a meat thermometer to prevent overcooking). I love the idea of the pecan crust though – maybe I’ll try a sous vide version, cooking the chicken first and then adding the crust and searing! I feel the same way about chicken. Fortunately, the butter/dijon mixture plus searing before going in the oven keeps it from drying out! I have never tried the sous vide method, so I can’t say how it might compare. 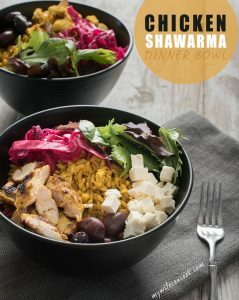 Looks pretty easy, and, delicious!!! So funny you can remember the first time you had this! Thanks! This year was a bad year for them, so I guess we’ll be hitting the store for pecans. I don’t normally eat chicken, but when I do– dijon is the best! I love the pecan crust too!